Executive Mosaic is honored to introduce Rob Joyce, White House cybersecurity coordinator, as an inductee into the 2018 edition of the Wash100 — Executive Mosaic’s annual selection of influential leaders in the government contracting arena — for his extensive support to the public and private sector in enhancing information intelligence assurance. Joyce also serves as special assistant to President Donald Trump and is responsible for the development and implementation of national and international cybersecurity strategy and policy for the United States. 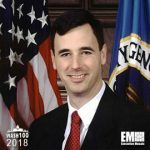 He worked for 27 years at the National Security Agency and held various leadership roles within NSA’s information assurance and signals intelligence missions. In October 2017, Joyce was selected to serve as deputy homeland security adviser to the president on an interim basis. The intelligence professional said at the Cyber Summit 2017 in October that the U.S. government supports technology companies’ device encryption efforts and does not seek “back door” access to smartphones and other mobile platforms. He also noted during the Summit that the government will help prepare the public and private sectors for information warfare in the future by identifying ways to impose sanctions on threat actors, including diplomatic, judicial, cyber and military responses. The White House cyber chief told The Cipher Brief in August that the government should establish a “close partnership” with companies to boost critical infrastructure security, which he named as his top concern among threats facing U.S.
Executive Mosaic congratulates Rob Joyce and his Cybersecurity team at the White House in receiving this award.